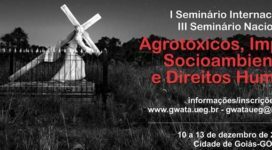 On Thursday the 29th of November 2018, an evening full of talks and images regarding the future of agriculture and the ambivalent position of the defenders of ecological farming on the one side and the ones claiming industrial farming as the way to go on the other side. The event “Visions for Agriculture 2050” took place in the historical cinema “Babylon” in Berlin-Mitte. In front of a crowd of a few hundred people eager to listen to environmental activist and physicist Dr Vandana Shiva facing a representative of one of her biggest rivals, Bayer AG, the ceremony was opened by Benny Haerlin, chairman of the “Foundation for the Future of Farming” (Zukunftsstiftung Landwirtschaft). The foundation cooperates with Navdanya at different levels, in the field, saving seeds, but also at major international decision-making events. On stage were Vandana Shiva, Norbert Lemken, head of the agriculture politics department of Bayer AG, and Prof. Dr. Sonoko Dorothea Bellingrath-Kimura, an agriculture and N- (Nitrogen) scientist. The heated discussion centered mainly on the opposing views of the speaker of Bayer AG and those of the founder of Navdanya. Prof. Dr. Bellingrath-Kimura’s positions were a good balance between both, her field of work being how to bring the N-cycle into a balance close to Nature after all the artificial inputs from the agro-chemical industry and the outsourcing from harvesting crops. Dr Vandana Shiva stated: “Biodiversity is the web of like, weeds are food and pests are insects, if left in the right balance. The Poison Cartel which began with the experiment of exterminating some humans in Hitler’s concentration camps has brought entire species to extintion. But there is much that we can do as individuals and communities. The defense of life in its vitality and diversity begings with saving one seed, planting one garden”. Benny Haerlin led the holistic discussion through topics such as the challenges of feeding a population that moves into cities, the scarcity of small scale farmers against big companies, the role of agroecology in the future of farming as well as the role of policies for a good governance. Norbert Lemken stated many times that “a bit of everything is needed, a better way of both ways of farming”. In his opinion, the mere practices of organic farming stand no chance to feed an ever-growing World population. Vandana Shiva strongly argued the opposite, saying that humankind has to step up natural cycles and remove all things it has done to Nature; “We have to get rid of the ignorance and the arrogance of the anthropocentric World”. In her opinion, biodiversity should not be brought to Nature, as it already is there, it’s all about preserving and multiplying activities that allow biodiversity to grow. After the panel discussion, the documentary film “SEED: The Untold Story”, produced by Taggart Siegel & Jon Betz and released in 2016, was shown. The film gives a powerful and beautiful image of the importance of seeds as a common good all over the World. 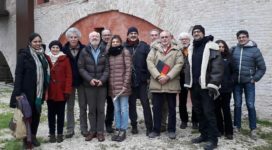 Visiting dedicated seed savers all over the World, it shows the importance of a common awakening in order to fight against the threat of the planet Earth becoming a big field where mostly monocropping reigns and modified seeds are increasingly produced. The screening of the film was followed by a discussion on the topic of seeds. Vandana Shiva and Stig Tanzmann (agriculture consultant for the German organization “Bread for the World”) were on stage to talk about the importance of seed saving and of the preservation of traditional varieties, for the sake of the health of the Planet, including all organisms (humans, animals, plants or even funghi). Vandana Shiva appears in the film as the initiator of a major movement of seed saving in India and later on all over the World. Her journey started in her hometown Dehradun, where a seed bank today preserves over 3513 different species and 700 rice varieties. A few questions from the mainly young audience showed the public’s commitment to aim for a better and greener future of farming and consuming. 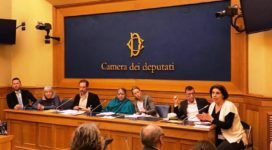 Vandana Shiva stated that a “youth movement for land access” is needed, as land prices are increasingly getting higher and higher. 50% of the European Union’s budget goes to agriculture. The final destination of this money should be reoriented to encourage small scale biodiverse farming. Stig Tanzmann stated that “farming is about diversity and beauty, just as seeds are”, it is our task to preserve this gift from Mother Nature. Many steps can be taken, starting by growing herbs in the kitchen, planting a tree in a public space, supporting organisations trying to preserve local traditional seeds – these are just a few examples. In order not to lose faith as big concerns are gaining weight and the change in climate can now be sensed everywhere, the way to go is to “take someone who did not think that way before” to rallies and initiatives working for a safe future. 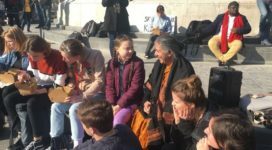 The very optimistic touch of the film could be felt in the room long after the end of the last scene, as well as the energy that emanates from Vandana Shiva, who “takes her energy from the public”.